1. Tape 8 sets of 2 popsicle sticks together. 2. Take 4 of the taped together popsicle sticks and form them into a square. Tape them together. This forms the base. 3. Take two more sticks from step 1 and tape them onto two adjacent corners of the square. 4. Now use the last two sticks from step 1 as supports for the corners. Make a triangle and tape the two sides together. 5. Now cut the cup to the desired height about 2 inches. 6. Take 2 more sticks and tape them to the cup. 7. 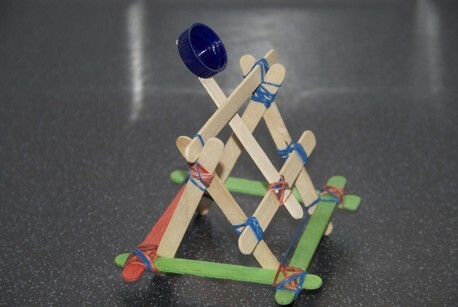 Next tape the end of the popsicle stick attached to the cup to the base of the catapult. 8. Tape one last popsicle stick across the top of the two triangles for support. 10. Then clip the other end of the elastic band to the support stick. Now get ready to have some fun!! See video below for visual instructions. How to make a catapult video.